This life-size cold cast poly resin and fibre-glass 3D model of a typical 1950's rebel , you can just image him in a high school causing trouble. He is perfect to add some glamour to your event. This model is perfect to fit into any hollywood scene, high school or 1950's display. 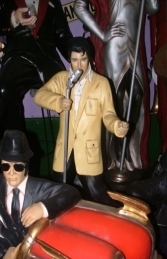 He has fantastic detail with his blue jeans and leather jacket, and a sturdy base for him to stand on.